Depending on how you use www.FieldOfDreamsCarShow.com, we may ask you to share personal information with us. Whether you choose to give www.FieldOfDreamsCarShow.com information is completely up to you, but keep in mind that if you withhold information, you may not be able to use some of our services. 1) Becoming a registered user. In order to register, you need to share some personal information, such as your name and e-mail address. You do not have to be a registered user to visit www.FieldOfDreamsCarShow.com web pages. But, you will have to register if you want to place orders or make full use of our online services. 2) Making a purchase. When you buy something on www.FieldOfDreamsCarShow.com, you have to supply a billing address, phone number, shipping address, and credit card information. By making a purchase, you become a registered user of Madis.us. We realize that our customers trust us to protect their personal information. We take that task seriously. We maintain physical, electronic and procedural safeguards to protect your personal information. We urge you to protect your own privacy. We recommend that you do not share your password with anyone or share your password in an unsolicited phone call or e-mail. WWW.FieldOfDreamsCarShow.com collects personal information primarily to make our services more rewarding for you to use. We usually use this information for internal purposes, such as studying our customers preferences. We may also use your information to contact you for account and promotional purposes. 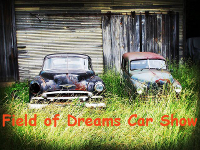 We use e-mail addresses to send out newsletters and promotional specials with information about Field of Dreams Car Show Inc’s new products, gifts and special features. When you register, you can choose not to receive these announcements by opting-out of delivery. If you receive an e-mail and want to avoid further messages, look at the end of the e-mail for instructions on how to remove yourself from the mailing list. You can also edit your e-mail preferences at www.FieldOfDreamsCarShow.com – My Account. Field Of Dreams Car Show Inc., may share your personal information with companies that perform services for us, such as fulfilling orders, delivering packages, sending postal mail and e-mails, analyzing customer data, providing marketing assistance, processing credit card payments, investigating fraudulent activity, conducting customer surveys, and providing customer service. They have access to personal information needed to perform their functions, but may not disclose your personally identifiable information for other purposes. Some personal information is stored on servers owned by other companies. Only Field Of Dreams Car Show Inc. has the right to access this information.